A rare combination of performer, choreographer, author, researcher and guru, Bharati Shivaji's name has become synonymous with Mohiniattam, the exquisitely graceful dance form of Kerala. Her initial training, under Smt. Radha Marar and Kalamandalam Satyabhama and later Smt. Kalyani Kutty Amma enabled her to spend many years with great masters, researching literary, sculptural and musical sources on the origins of this art. By incorporating her research into her performance,she has broadened the once-stagnant repertoire and given the dance form a fresh lease of life to the dance form by . Her successful group-choreographic productions incorporating themes from the Chandrotsavam (from the Manipravalam literature), the Somastuthi from the Rig Veda, and the Devagita inspired by the renditions of the Ashtapadis in temples have added a new dimension to the art form . Her book “The Art of Mohiniattam" is a culmination of the first-hand experience of delving into the traditional arts of Kerala. Bharati Shivaji has also received training in the Bharatanatyam from Smt. Lalita Sastri and has performed both styles to wide acclaim in Europe, Latin America, and Asia. Her Mohiniattam is marked by extreme grace and fluidity of movement, while the hallmark of her Bharatanatyam is geometrical precision and technical finesse. She is known for the innovations she has introduced to ensure the appeal of Mohiniattam among contemporary audiences and for the dance drama productions she has choreographed. 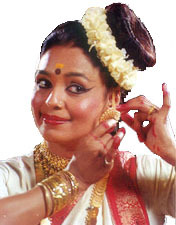 She has also set up the Center for Mohiniattam which is devoted to the training and propagation of this dance form.